A memorandum of understanding (MOU) on tourism cooperation was signed between Spain and South Korea in Madrid on Feb. 13 as South Korean President Roh Moo-Hyun was visiting Spain on his official state visit, according to local Ministry of Culture and Tourism. President Roh became the first South Korean president who visited Spain since establishment of the diplomatic ties between South Korea and Spain in 1950. 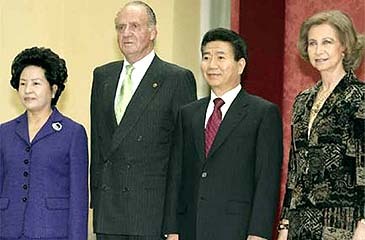 President Roh arrived in Spain on Feb. 12, 2007 (local time) for four-day state visit. He met with Spanish King Juan Carlos and Spanish Prime Minister Jose Luis Rodriguez Zapatero for talks on strengthening mutual cooperation. Roh was supposed to meet with the former IOC president Juan Antonio Samaranch and ask him for help for South Korea bidding for the 2014 Pyeongchang Winter Olympic Games. But their meeting was cancelled as Mr. Samaranch called in sick. After rounding up his visit to Spain President Roh will move on to Vatican City on Feb. 15, 2007 and Italy on the following day. The MOU was aimed at exchanging and sharing information on each country's tourism and exchanging tourism experts of each nation, as well. The agreement takes aim at boosting investment for tourism by nongovernmental sectors, and taking part in seminars and expositions to be hosted in each country. Some 50,000 South Koreans visit Spain whereas a total of 6,789 Spanish people came to Korean in the year 2005. With this MOU signed by each nation, cooperation and exchanges in the tourism sector are expected to be actively promoted. "It is kind of belated for South Korean to sign tourism MOU with such global tourism country as Spain," said a Culture Ministry source. "It is really a good opportunity for South Korea to be able to gain access to high-quality information of Spain on its tour and travel industry." In the year 2005 a total of 55,577,000 foreigners visited Spain, bringing 47.9 billion US dollars of tourist revenue to the European country. Spain is vying with the United States for a No. 2 tourism nation spot. France is most popular destination among the people around the world.